My rating: 8/10. Olivia Burton Ladies’ Big White Dial watch. Quartz powered timepiece. Hello, today I’m doing a Olivia Burton OB16BD97 review. 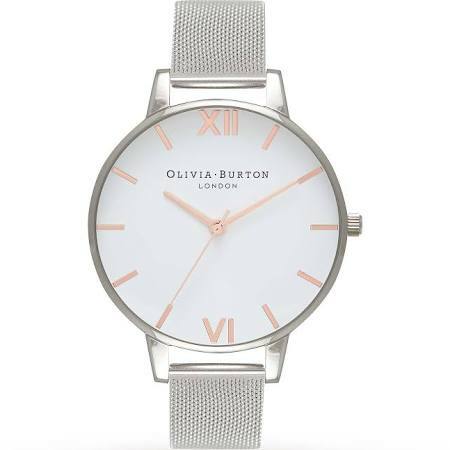 This is another popular Olivia Burton timepiece, this time featuring a large white dial with a mesh style stainless steel strap. I hope you enjoy this Olivia Burton OB16BD97 review below. This popular Olivia Burton watch features a large white dial with rose gold PVD detailings for the hands and hour markers. Olivia Burton London is positioned around the 12 o’clock position of the dial. The casing of the watch is made of steel, there’s a small crown located at the 3 o’clock position for operating the quartz movement. The watch features a mineral crystal glass that’s been specially hardened to offer extra protection from scratches and knocks. It’s commonly found on many watches in this price range. At the heart of this Olivia Burton watch is a reliable and accurate Japanese quartz movement. 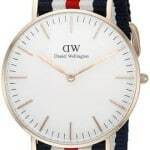 Again this is found in many watches in this price range, quartz movments are affordable and require very little maintenance. The casing diameter of this Olivia Burton watch measures approximately 38mm. The thickness of the case is quite slim at just 8mm which is also nice to see. The strap is made of a stainless steel mesh style strap that fastens with a jewellery style clasp that’s very easy to adjust. This watch has a decent 30m water resistance rating. A 30m or 3 bar rating makes this watch suitable for everyday use. Splash/rain resistant. Not suitable for showering, bathing, swimming, snorkelling, water related work and fishing. Band: Stainless steel strap, standard length, 18mm width, jewellery style clasp. Case: Stainless steel casing, sizing diameter: 38mm and thickness: 8mm. 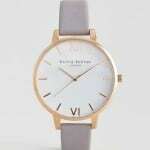 Overall it’s another brilliantly designed watch from Olivia Burton. The watch is well built with a simplistic high end style that makes the watch ideal for both business and casual occasions. Hope you enjoyed this Olivia Burton OB16BD97 review. Find more watch reviews below.